The Interventional Cardiology Fellowship Program at the State University of New York (SUNY) Health Science Center at Brooklyn (Downstate) is a one-year program that is fully accredited by the A.C.G.M.E. ( American Council for Graduate Medical Education ). It provides advanced training for fellows pursuing a clinical or academic career in interventional cardiology who have completed an accredited three- year cardiology fellowship program in the U.S. or abroad. During the program, fellows rotate 9 months at Downstate's University Hospital and 3 months at the affiliated Staten Island University Hospital. The interventional cardiology fellowship program includes hands-on training, participation in research projects and other opportunities including weekly journal club and cardiovascular conferences . 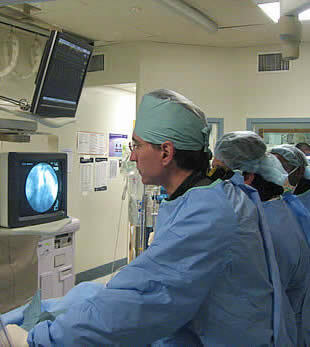 Working with nationally and internationally known SUNY Downstate faculty members, each fellow will participate and/or have primary operator experience in a minimum of 400-600 coronary interventions during the course of the fellowship. Fellows receive advanced training in rotational atherectomy, peripheral vascular interventions, intravascular ultrasound, physiologic assessment of lesions, acute MI management and interventions, distal protection devices, and a variety of other novel technical modalities, such as ASD/PFO closure. See fellowship curriculum. There are also a variety of basic and clinical cardiovascular research opportunities for fellows, including participation in Dr. Marmur's research projects. The program offers four positions per year; two positions cycle between July 1 st -June 30 th , one position cycles between September 1 st -August 31 st , and the final position cycles from January 1 st -December 31 st . Graduates of this program are eligible for, and have been uniformly successful in, the completion of board certification in the sub-specialty of interventional cardiology.